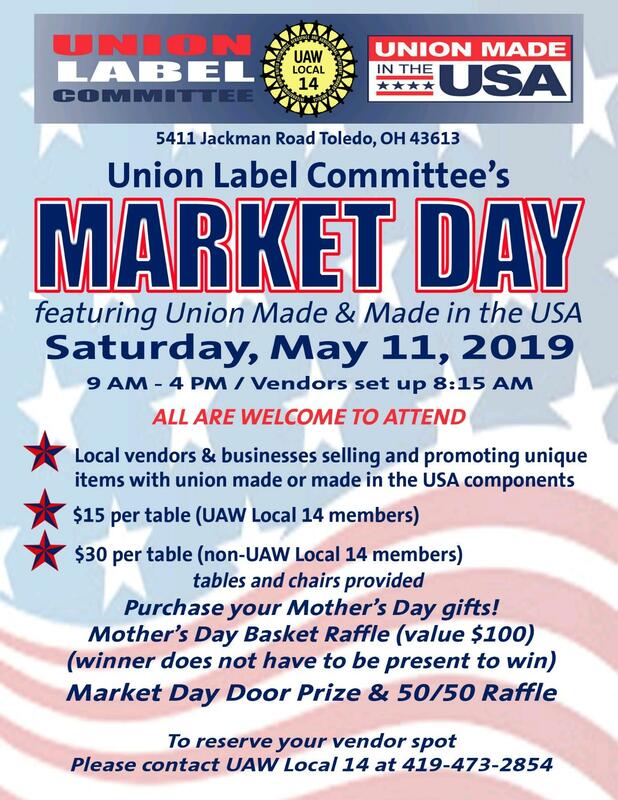 SATURDAY, MAY 11, 2019 LOCAL 14 UAW HALL, 9 AM - 4 PM FEATURING UNION MADE & MADE IN THE USA Local vendors and businesses selling and promoting unique items with union made or made in the USA components. Local vendors and business that sell or promote items Made in the USA or Union Made. There will be a Mother's Day Basket raffle. 50/50 raffle and door prizes. Do you make a product using a made in the USA componant or union made. We need you! Vendor spots now available. Cost includes tables and chairs. Sign up now at the Local 14 Union Hall or print and fill out the attached vendor form and return to the union hall.